Jim Busby is the majority owner and President of Security Owners Corporation, and a licensed building and general engineering contractor. He studied at the University of Idaho, San Francisco Law School and the University of California in Berkley. Jim entered the title insurance business and worked his way up to the position of Chief Title Officer and Vice President of North American Title Guaranty Corporation. He left this position to enter the field of real estate development. Employed by Security Owners Corporation to manage real estate investments, he purchased raw land parcels for the purpose of long term investment. In 1963, Jim acquired a 10% interest in the corporation and started a construction program. Each year thereafter, the construction program escalated until Jim bought all of the remaining stock in the company and became the sole owner. Jim and his Companies have developed the land for, and constructed approximately 4,000 homes consisting of major apartment complexes, condominiums, townhouses and single family subdivisions predominantly in East Bay Area communities. Security Owners Corporation is structured to continue real estate development and to own and manage income properties. The Company owns and operates several apartment projects and office buildings in the San Francisco East Bay Area. Jim is proud that four of his children are associated with the company and are skilled professionals, capable of taking the company to new heights of success. Jim enjoys his role in the Building Industry Association, and served as a Director for the local, region and state Boards. 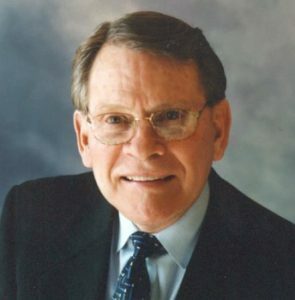 He was past President of the local division and Chairman of the Regional Board, State Legislative Committee and State Political Action Committee. In 2000 he was elected as a “Lifetime Director” with voting rights in the California Building Industry Association, and considers this position one of his highest honors. Jim is also one of 22 trustees overseeing Pacific Legal Foundation, the largest non-profit public interest law firm dedicated to protecting freedom and the free enterprise system. ​Congratulations Jim for the energy and vision you bring to the challenges of the real estate industry and for your tireless involvement in the process of business and politics.